It’s Carnival time and one sweet pastry that mustn’t be missing during this particular time is the ” Faschingskrapfen” ! Freshly made Krapfen, a delicacy to die for! That’s what I thought when I was little, and to this day I am keeping my eyes out for them on every visit to Germany, no matter if it’s “Faschings”-time or summertime. Although considered a carnival specialty, you can find the light and fluffy Krapfen in German/Austrian bakeries most anytime . The only problem I am having with then in Germany these days is that finding the (in my eyes original ) Krapfen filled with apricot jam is often a challenge! (Raspberry jam just doesn’t work for me.) Needless to say, it’s even harder to find a decent Krapfen here in California unless you venture off to certain German stores, but even then you might not find what you are looking for. Therefore, for all our CaliforniaGermans craving some Krapfen, here is a delectable Austrian recipe , the “Sacher-Faschingskrapfen” ! Should you give the recipe a try, let us know how it turned out: Send us some pictures of your Krapfen experiment! Warm up about 2 tablespoons of milk to drinking temperature and dissolve the yeast in it. Stir in a little flour to create a thick-pasted pre-dough. Sprinkle with flour, cover with a cloth and leave to rise in a warm place (28–30 °C) for about 15 minutes, until the surface begins to show small cracks. Use the rest of the milk and stir together the egg, egg yolks, salt, icing sugar, vanilla sugar, grated lemon rind and rum. Add the melted butter and beat. Using a blender with a kneading hook, blend the mass with the remaining flour and the yeast dough until smooth. Cover with a cloth and leave to rise at room temperature for about 1 hour. Knead the dough again and on a floured surface shape into a roll. Cut nut-size pieces about 20 g in weight and, using the palm of your hand, shape into round balls. Dust with flour and press them a little with a baking tray. Place on a baking tray and leave to rise in a warm place. Heat some oil (160 °C) in a pan for deep-frying or in a saucepan and fry a golden brown on both sides. Scoop out and place on a cake grid to drain. 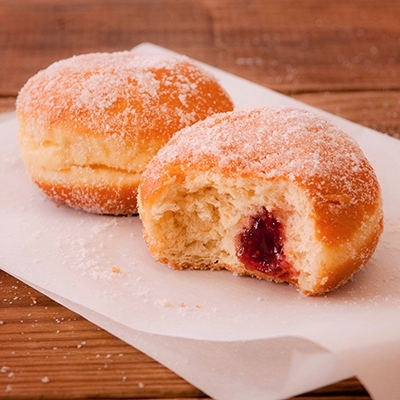 Fill a pastry bag with the rum-jam mix and squeeze into the doughnuts. Dust with icing sugar. An alternative Krapfen recipe can be found here.